After the 1983 split of 10CC, Graham Gouldman and Andrew Gold started working together in England. During a period of seven months they wrote enough songs for an album. They chose World In Action as the band name and released a single called 'Don't break my heart'. Soon afterwards they changed their name to Common Knowledge. A second single 'Victoria' was released, but both singles failed to get any attention and the album was shelved. 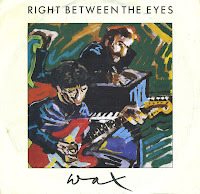 When they had written a new batch of songs and changed labels, they took on the name Wax. Their first album, released in 1986 was called 'Magnetic heaven' and contained their first hit single: 'Right between the eyes', whcih reached number 60 in the UK singles chart and number 25 in the Dutch Top 40. 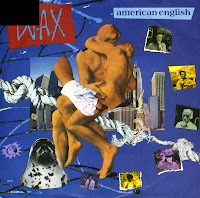 After the success of 'Building a bridge to your heart', Wax released the title track of their second album 'American English' as the second single from that album. While the single was just as upbeat and a little more dynamic than the previous one, it did not make a dent in the charts anywhere. I don't even remember how I got to hear this track, but I do know I liked it so much that I bought it quickly. 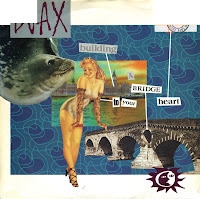 Starting off with the most confusing countdown in pop history, Wax (a duo consisting of Andrew Gold and Graham Gouldman) released 'Building a bridge to your heart' as the first single of their second album 'American English'. Although the single did not get any further than 12th place in the UK singles chart, it was a number 1 hit in Sweden and the Netherlands. It would also be their last hit in most territories.